Drivers' Champion: Nelson Piquet Jr.
Nelson Piquet Jr. became the first ever Formula E Drivers' Champion. 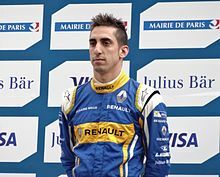 Sébastien Buemi finished second in the drivers standings, missing out on the championship by 1 point. 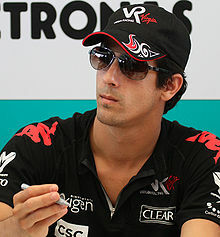 Lucas di Grassi (pictured in 2010) won the first Formula E race, and finished the season third. The 2014–15 FIA Formula E season was the inaugural season of a new FIA championship for electrically powered cars. It began on 13 September 2014 at Beijing in China and finished on 28 June 2015 in London after eleven races. 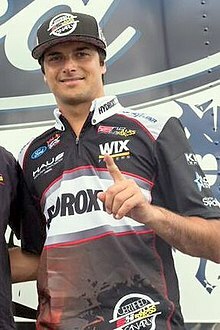 Nelson Piquet Jr. came first in the overall standings, and so became the first ever Formula E champion. Spark-Renault SRT 01E in Andretti colors. For the first season, all teams were supplied an electric racing car built by Spark Racing Technology, called the Spark-Renault SRT_01E. The chassis was designed by Dallara, with an electric motor developed by McLaren (the same as that used in its P1 supercar), a battery system created by Williams Grand Prix Engineering and a Hewland five-speed gearbox. Michelin were the official tyre supplier. 42 electric cars were ordered by the FIA. For the 2014–15 season, 10 teams contested the series. Each team fielded two drivers; each driver had two cars. That meant that 40 cars were required by the teams. All teams were ostensibly based at the sport's technical headquarters at the Donington Park race circuit, in the United Kingdom, although some teams had a greater presence there than others. Formula E organiser FEH itself has offices there for administration and operations staff. All ten teams were confirmed to race in April 2014. However, in June 2014, Drayson Racing pulled out of the championship, with its entry taken by Trulli, a new team formed by former Formula One driver Jarno Trulli. Drayson entered the team in a supply and sponsorship arrangement, to be its principal technology partner. 2014 Punta del Este ePrix. The season included 11 races, held between September 2014 and June 2015. The initial calendar had ten races and was approved by the FIA World Motor Sport Council in December 2013. However, in April 2014, changes were made to the calendar including dropping Rio de Janeiro, which had previously replaced Hong Kong, and moving the Los Angeles round to 4 April. On 22 May 2014, Los Angeles County officials announced that their race would take place 40 km (25 mi) away on a modified version of the Long Beach street circuit. On 3 February 2015, it was revealed that a race would be held in Moscow on 6 June, to restore the calendar to its original schedule of ten races. On 19 February 2015, it was announced that the final round in London would be a double-header, expanding the calendar to eleven races. ^ Nicolas Prost set the best time during qualification in Putrajaya, and accordingly, scored the three championship points on offer. He started from eleventh on the grid, following a ten-place grid penalty which was levied on him, for causing a collision with Nick Heidfeld in Beijing. Therefore, Oriol Servià, who set the second-fastest time, started the race from pole position. ^ Sébastien Buemi set the fastest time but had that time deleted for power overuse. ^ Lucas di Grassi and Audi Sport Abt were the initial winners but were disqualified when di Grassi's car was found to have breached technical regulations. ^ Stéphane Sarrazin and Venturi were the initial winners, but were given a post-race 49 second time-penalty for exceeding the maximum energy usage. Each driver's lowest-scoring round was dropped from their total; however, rounds where the driver was excluded from the race could not be dropped. The points system was the same as the Drivers' Championship, except that all rounds counted towards the total. ^ "FIA Formula E". fia.com. Fédération Internationale de l'Automobile. Archived from the original on 15 September 2012. Retrieved 31 August 2012. ^ a b "The final 2013 meeting of the FIA World Motor Sport Council (WMSC) took place today (4 December) in Paris, France". fia.com. Fédération Internationale de l'Automobile. 4 December 2013. Retrieved 4 December 2013. ^ a b "Formula E: Moscow ePrix puts series calendar back to 10 races". FOXSports.com. 3 February 2015. Retrieved 27 February 2015. ^ "Nelson Piquet Jr. wins first ever Formula E title". ITV. Retrieved 28 June 2015. ^ "Michelin confirmed as official tyre supplier for FIA Formula E Championship". Formula E Operations. FIA Formula E Championship. 28 March 2013. Archived from the original on 2013-04-05. Retrieved 2013-03-29. ^ "Renault signs with Spark Racing Technology and Formula E Holdings as Technical Partner in the FIA Formula E Championship" (PDF). Formula E Operations. FIA Formula E Championship. 15 May 2013. Archived from the original (PDF) on 2013-06-12. Retrieved 2013-05-15. ^ "Williams partners with Spark Racing Technology to provide battery expertise for the FIA Formula E Championship". WilliamsF1.com. Williams F1. 11 June 2013. Archived from the original on 16 October 2014. ^ "Formula E buys 42 electric racers for 2014 circuit". green.autoblog.com. 18 November 2012. ^ a b "Jarno Trulli to race in Formula E with own TrulliGP outfit". Formula E Operations. FIA Formula E Championship. 18 June 2014. Archived from the original on 25 September 2014. Retrieved 18 June 2014. ^ a b c d e f g h i j "Spotters guide to Formula E". FIA Formula E Championship. Formula E Operations. 12 December 2014. Archived from the original on 4 January 2015. Retrieved 18 December 2014. ^ a b "Jaime Alguersuari and Sam Bird join Virgin Racing". Formula E Operations. FIA Formula E Championship. 13 May 2014. Archived from the original on 30 August 2017. Retrieved 13 May 2014. ^ "Leimer replaces Alguersuari for London". Formula E Operations. FIA Formula E Championship. 23 June 2015. Archived from the original on 27 June 2015. Retrieved 23 June 2015. ^ a b "Karun Chandhok and Bruno Senna sign for Mahindra Racing". Formula E Operations. FIA Formula E Championship. 26 May 2014. Archived from the original on 27 May 2014. Retrieved 26 May 2014. ^ "Oriol Servia to race for Dragon in Beijing". Formula E Operations. FIA Formula E Championship. 5 September 2014. Archived from the original on 6 September 2014. Retrieved 5 September 2014. ^ "Mike Conway leaves Formula E, Oriol Servia steps in at Dragon". Autosport.com. 5 September 2014. Retrieved 5 September 2014. ^ "Duval gets Dragon seat for Miami". Formula E Operations. FIA Formula E Championship. 9 March 2015. Archived from the original on 2 April 2015. Retrieved 9 March 2015. ^ "Jerome d'Ambrosio to compete in Formula E with Dragon Racing". Formula E Operations. FIA Formula E Championship. 22 July 2014. Archived from the original on 28 July 2014. Retrieved 22 July 2014. ^ a b "Buemi, Prost confirmed as e.dams drivers". GPUpdate.net. 30 June 2014. Retrieved 30 June 2014. ^ "Michela Cerruti joins TrulliGP to become second female driver". Formula E Operations. FIA Formula E Championship. 30 June 2014. Archived from the original on 30 June 2014. Retrieved 30 June 2014. ^ "Vitantonio Liuzzi to replace Michela Cerruti in the Miami ePrix". Trulli GP. 12 March 2015. Retrieved 12 March 2015. ^ "Fontana to race at London ePrix with Trulli". Motorsport. Motorsport.com. 25 June 2015. Retrieved 25 June 2015. ^ a b "ABT Sportsline unveils Formula E driver line-up with Lucas di Grassi & Daniel Abt". Formula E Operations. FIA Formula E Championship. 13 February 2014. Archived from the original on 21 February 2014. Retrieved 13 February 2014. ^ DiZinno, Tony (29 May 2014). "Franck Montagny confirmed for Andretti's Formula E team". MotorSportsTalk. NBC Sports. Retrieved 31 May 2014. ^ "Jean-Eric Vergne to compete with Andretti in Uruguay". FIA Formula E. 8 December 2014. Archived from the original on 8 December 2014. Retrieved 8 December 2014. ^ "Marco Andretti to Drive in Buenos Aires ePrix". Andretti Formula E Team. 12 September 2014. Archived from the original on 2015-03-03. Retrieved 5 March 2015. ^ "Matthew Brabham to race for Andretti in Putrajaya". FIA Formula E. 20 November 2014. Archived from the original on 23 November 2014. Retrieved 20 November 2014. ^ "Marco Andretti to Drive in Buenos Aires ePrix". Andretti Formula E Team. 2 January 2015. Archived from the original on 2 January 2015. Retrieved 2 January 2015. ^ "Scott Speed to race for Andretti in Miami". Formula E Operations. FIA Formula E Championship. 5 March 2015. Archived from the original on 7 March 2015. Retrieved 5 March 2015. ^ "Justin Wilson to race for Andretti in Moscow". Formula E Operations. FIA Formula E Championship. 27 May 2015. Archived from the original on 27 June 2015. Retrieved 27 May 2015. ^ "De Silvestro to race in Visa London ePrix". Formula E Operations. FIA Formula E Championship. 14 June 2015. Archived from the original on 27 June 2015. Retrieved 15 June 2015. ^ a b "About — Katherine Legge". Amlin Aguri. 27 June 2014. Archived from the original on 14 July 2014. Retrieved 27 June 2014. ^ "Takuma Sato rejoins old F1 team Aguri for Beijing Formula E race". Autosport. Haymarket Publications. 11 September 2014. Retrieved 28 December 2014. ^ "About — Antonio Felix da Costa". Amlin Aguri. 2 July 2014. Archived from the original on 31 January 2015. Retrieved 2 July 2014. ^ Biesbrouck, Tim. "Yamamoto replaces Felix da Costa in London". Electric Autosport. Formula Blue Media. Retrieved 15 June 2015. ^ "Durán replaces Legge for Punta del Este ePrix". e-racing. 9 December 2014. Archived from the original on 10 December 2014. Retrieved 9 December 2014. ^ "Spotters guide to Formula E". FIA Formula E Championship. Formula E Operations. 21 May 2015. Archived from the original on 27 June 2015. Retrieved 28 May 2015. ^ "Nelson Piquet Jr. and Ho-Pin Tung sign for China Racing". Formula E Operations. FIA Formula E Championship. 21 August 2014. Archived from the original on 21 August 2014. Retrieved 21 August 2014. ^ "Tung returns for Buenos Aires". FIA Formula E Championship. Formula E Operations. 31 December 2014. Archived from the original on 2 January 2015. Retrieved 31 December 2014. ^ "Garcia joins China Racing in Uruguay". Formula E Operations. FIA Formula E Championship. 1 December 2014. Archived from the original on 14 December 2014. Retrieved 10 December 2014. ^ "Charles Pic to make FE return with China Racing". Autosport. Haymarket Publications. 12 March 2015. Retrieved 12 March 2015. ^ "McLaren F1 test driver Oliver Turvey to make Formula E debut". autosport.com/. Autosport. 18 June 2015. Retrieved 18 June 2015. ^ "Nelson Piquet Jr secures Formula E drive with China Racing". Autosport. Haymarket Publications. 21 August 2014. Retrieved 21 August 2014. ^ a b "FIA confirms Formula E updates following World Motor Sport Council". FIA Formula E Championship. Formula E Operations. 11 April 2014. Retrieved 28 December 2014. ^ "Formula E to race at IndyCar and ex-F1 venue Long Beach". Autosport. Haymarket Publications. 22 May 2014. Retrieved 22 May 2014. ^ Watkins, Gary (19 February 2015). "Formula E London race to be a double-header in Battersea Park". Autosport. Haymarket Publications. Retrieved 19 February 2015. ^ "2014/2015 Calendar". formulae.com. Archived from the original on 28 December 2014. Retrieved 1 December 2014. ^ van Leeuwen, Andrew (22 November 2014). "Oriol Servia on pole, Nicolas Prost fastest". Autosport. Haymarket Publications. Retrieved 28 December 2014. ^ "Nicolas Prost clinches pole position for the Putrajaya ePrix". FIA Formula E Championship. Formula E Operations. 22 November 2014. Retrieved 28 December 2014. ^ "Di Grassi excluded from DHL Berlin ePrix". Formula E. Formula E Holdings. 23 May 2015. Retrieved 1 October 2016. ^ Watkins, Gary (28 June 2015). "London Formula E: Nelson Piquet Jr wins title, Sam Bird wins race". Autosport. Haymarket Publications. Retrieved 1 October 2016. Wikimedia Commons has media related to 2014–15 Formula E season.